The best bathroom layouts not only make the best use of available space, but also feature creative bathroom design ideas - resulting in a beautiful room. Making a detailed floor plan to scale is well worth the effort. It will streamline your thoughts and help you visualize design and decor solutions for your space and it will help you generate bathroom floorplans that can be submitted for approval, should you need to do so. Make a list of must haves and think it through. Do you really need that whirlpool tub for two or will a deep (smaller) soaking tub and a luxurious shower suit your lifestyle better. 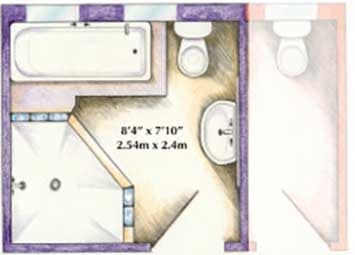 The same bathroom floor plan can assist you in planning your floor tile layout. You can draw in border patterns, a "carpet" tile feature or a broad accent band that may continue up a wall to set off a vanity. Print out a couple of sheets of the graph paper in your chosen measurement (inches or centimeters), cut out the fixtures and start playing around with the layout. When you print out the sheet with additional fixtures, be sure to have your printer settings the same as when you print the graph sheet. (Note though, there may be some small discrepancies in measurements). We've provided some standard sized fixtures to get you going, but it's easy to get the measurements of your chosen fixture and to draw it to scale on the graph paper. Using the standard fixtures at first in your bathroom layouts will very quickly show you whether you need to downscale sizes or if you can house that big his and hers shower or generous tub. Draw the internal dimensions of your bathroom walls on the graph paper. Add the immovable elements: Door, windows and water and waste points (if it's absolutely not within your budget to change them). Do take a good look at the design possibilities that can materialize with clever placement of your Bathroom Doors and especially, Pocket Doors - they must be the ultimate space saver! Mark the electrical outlets and switches. 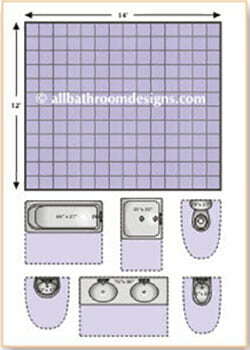 Position your bathroom fixtures in order of importance and size: Tub, shower, vanity, toilet and bidet. 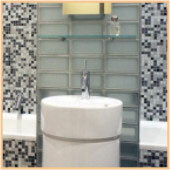 Position fittings such as towel rails, toilet tissue holders, wall shelves, radiators, soap dispensers etc. The clearance areas around the fixtures (colored purple) are general guidelines only. They can overlap one another but are really just minimum requirements. It is essential to get the building codes and specifications for your local area and to confirm whether you need to submit a detailed plan and get a building permit. You may also need to consult with a professional on whether you have to make structural changes, for example to support a big or heavy tub. Your first glance into the bathroom should ideally showcase a beautiful area. Take note which way the door swings open and if necessary and possible, change it. Or replace it with a sliding door if you are cramped for space. 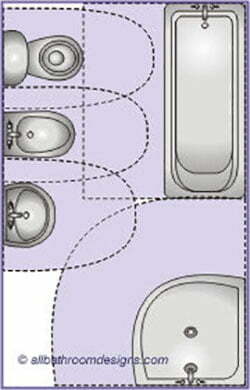 The toilet or bidet is not the most attractive feature in the bathroom, so try to hide them from view. If your shower will be right opposite the door, do add a wow factor with beautiful fittings and tile treatment. Where will you create a beautiful focal area within your arrangement. Do your bathroom layouts make the most of available natural light, or should you consider enlarging a small window or adding a feature window. A great way to add natural light to a bathroom without windows is to use light from an adjoining room. 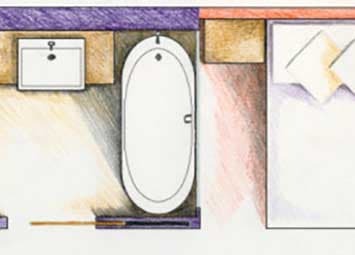 Our Designs for Small Bathrooms can give you an idea or two on how to open up spaces. Do you have enough working space and a big enough toweling-off area. Do you have space for a feature wall to screen and add privacy to the toilet. Adding internal walls cleverly, can open up so many more layout possibilities - not everything needs to be arranged around the outer walls. Do you have to forego a fixture or can you add a second vanity or have a more generous shower, with a built-in seat perhaps. 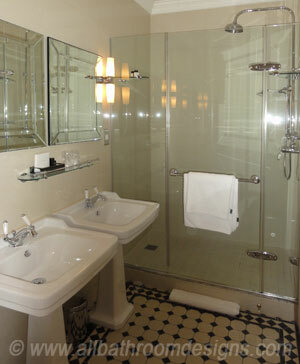 Did you have a good look at adjoining areas to you bathroom where you may steal space from? Perhaps a closet in the passage can be forfeited to enlarge the bathroom or there's more floor space available over a staircase. Get hold of your house plans and have a good look. Perhaps there is a sloping roof space that can be opened up to create an alcove for a tub. Do you have enough storage space. Did you make provision for mood and accent lighting. Your bathroom style or theme will also play a role in your bathroom layouts, whether it's a Japanese bathroom or a vintage bathroom. Whatever your style, draw the elements to scale and get creative with your bathroom plans!